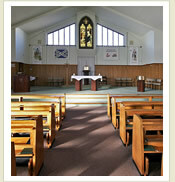 The growth in population reflected in the increased attendance in St. Matthew's (in centre of Bishopbriggs, the Mother Church), and initiated discussion as early as 1966 and gradually the need for the formation of a new parish crystallised. From early March 1971, Holy Mass was celebrated every Sunday and Holy Day of obligation in St Helen's Primary School by a priest from St. Matthew's. On December 4th 1973, Fr Michael O'Keefe was appointed Parish Priest and on December 16th 1973, in St Helen's Primary School, celebrated his first Mass as Parish Priest of the new St Dominic's Parish. 1975 saw work begin on the Church of St. Dominic. 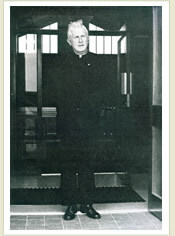 The first Mass in the completed church was celebrated on July 10th 1977 by Fr O'Keefe. Above the Tabernacle is an attractive stained glass window depicting the Annunciation (acquired from the Church of Notre Dame, Dowanhill). Stained glass windows also feature on both sides of the church depicting Saints Columba, Kentigern, Andrew and Patrick. On September 11th 1977, the official opening ceremony was performed by the then Archbishop Winning. Work commenced on the construction of the long awaited Parish Hall, adjacent to the church, in 1995 and was officially opened by Cardinal Winning on June 11th 1996. In 1998, the Parish Community of St Dominic- united in Faith - celebrated the Silver Jubilee of the Parish. Four years later, on Thursday September 19th 2002, the Silver Jubilee of St Dominic's Church was celebrated by the Most Reverend Mario Joseph Conti, Archbishop of Glasgow.